i LOVE Norah Jones...can't wait 'til her new album is out. birthday present, anyone? woke up at 4:30 this morning to the lovely sound of paul snoring like a chainsaw. he was also doing that thing where he bends his leg with his knee in the air, and then it keeps trying to fall over and he keeps standing it back up, and it shakes the bed. that problem was easier to fix than the snoring, but i did eventually get him to roll over. 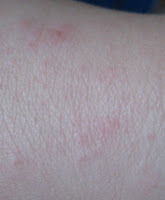 i have a rash on the back of my right hand...when i itch it, it grows; when i stop, it shrinks into one little red dot. right now it's medium-sized patchy field of tiny bumps. yesterday i thought it was a hive, but it's definitely a rash. luckily i have some cortizone. paul and i rented last night: the illusionist which was entertaining but not especially great, the devil wears prada which i plan to watch this afternoon (see below), and an inconvenient truth which we will probably watch tonight. we'll have to rent at least two more movies this month, because our three rentals yesterday got us rent-one-get-one-free for the next two weeks. last night was a very nice evening: i got home from work and made pizza dough, then while it was rising paul and i went to borders and hollywood video, when we got home he chopped veggies while i rolled out the dough (it fit perfectly onto the new pizza stone we got from paul's family for christmas! it was also the best pizza dough i've ever made, so try this recipe! ), then while the veggies roasted in the oven we started the movie. after 30 minutes we got the veggies out (eggplant, green zuccini squash, yellow zuccini squash, plum tomatos, baby portabellas, red onion), popped the crust in for 5 minutes, added the sauce (i used the roasted red pepper and artichoke tapenade that rachel got me for christmas as sauce - delish!! ), added the veggies, and feta and mozerella cheeses, and back in the oven for 15 minutes. 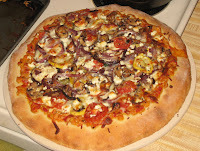 we watched a bit more movie while the pizza baked, then finished the movie with yummy wonderful veggie pizza! the movie ended around 10:45,and we went to bed...usually when we do that much stuff in one evening, we're up until at least midnight! it was a spontaneously wonderful evening. i bought "the denial of death" by ernst becker on amazon yesterday, free because i bought it used so it fit on an old partially-used reward certificate from my amazon credit card...there was $9.06 left on the certificate, and now there is $0.24 left. it's the next book group book for church down here...i also need to get a hold of the trinity nawakwa book group book, but i don't want to buy it because it looks cute, but not like something i'll want to re-read. eat a slice of bread, go on a jog/walk, clean the kitchen & bathroom, then go thru all my france pictures while i watch the devil wears prada, which i finally rented in english so i can see what the heck was going on. i saw it in french while visiting han...we thought it was in english with subtitles, but it ended up being dubbed, so i have this weird memory of it, because i've seen it, and i know the general arc of the plot, but i can't remember any details because, oh yeah, it was all in french and i don't speak french. it's not like i remember them speaking french in the movie, either, because when you totally don't know something it doesn't stick in your head, so i kind of have a silent memory of the film with some associated feelings and emotions. it's actually very much like remembering a dream you've had but you can't make sense of it: it's just kind of a wash of impressions. ok so i'm going to go start all that, and add to this post later to see what i've actually completed. oh, and maybe finally post some france pics. my main goal for the france pics, tho, is to print out some 8x10's and fill up all the cheap picture frames i bought at ac moore a few months ago. i have a bunch of big sheets of card stock left over from christmas presents, so i'm excited to use that as matting. PS: you can click on the pics to see them full-sized...this is especially good with the delicious pizza pics!